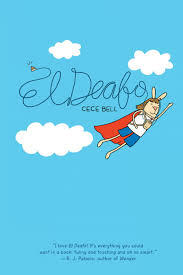 El Deafo is a wonderful graphic memoir loosely based upon the author’s own experience moving from a school for the deaf to a public school classroom. This has proved to be a little tricky, especially because her teacher keeps forgetting to turn his microphone off so she can hear him EVERYWHERE- when he’s getting lunch, when he’s talking to other teachers, even in the bathroom. It’s also tricky because she has to make new friends, and this year she has one quest: find the perfect friend. There’s plenty in this book for anyone who has ever felt different to relate to (isn’t that most of us?) and an equal amount for everyone who has ever wondered what it means to be a friend. Visit the publisher’s page and the author Cece Bell. Listen to an interview with Cece Bell.